Focused on the weekend ahead: Both Stephen Rochford and Cillian O'Connor are looking no further than this Sunday's game with Sligo. Photo: Sportsfile. Sligo are the only team on the minds of Mayo players and management as they prepare an assault on the 2017 Connacht championship against the Yeats County in MacHale Park on Sunday afternoon. Both Stephen Rochford and his captain Cillian O’Connor were quick to shoot down any notions of Mayo being talked up as Nestor or Sam Maguire cup contenders until those trophies were on the line in a given game. Until then the name of the game is entirely the opposition in front of them. 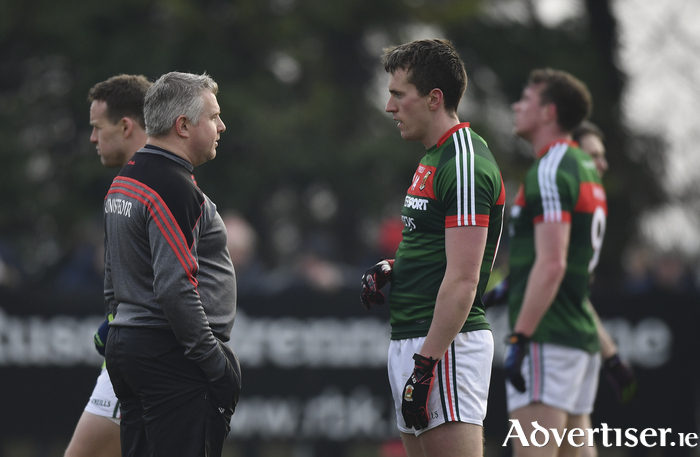 Speaking to the Mayo Advertiser at the launch of the Connacht Senior Football Championship in Bekan last week, Stephen Rochford was at pains to point out that the result of the Connaught final in 2015 against Sligo would have no bearing whatsoever on this year’s encounter. Rochford was never in any doubt that it was going to be the Yeats County his side would be kicking off their championship season against. With the array of attacking talent at Niall Carew’s disposal the AIB bank manager fully expected Sligo to overcome the challenge of New York two weeks ago. Rochford’s appointed captain Cillian O’Connor heads into the 2017 championship on the back of his most consistent league campaign since 2013. Starting all seven games and finishing as Mayo’s top scorer with 2-32 for the campaign. Recovering from injuries have been a necessary evil for the Ballintubber marksman in the early months of each year since injuring his shoulder prior to the 2013 All-Ireland semi-final so seeing a full complement of league action had the captain in fine form ahead of the championship throw-in. “I had a shoulder injury a couple of years ago and I had my knee injury which I had operated on at the end of 2015 and thankfully both of those are fine and I played all the league games and I’ve trained the last few months injury free”. The 24 year old recently began work in St Patrick’s National School in Castlebar and having the commute to and from Dublin taken out of his schedule has definitely aided in his recovery and preparation. Speaking of the challenge posed to Mayo and their attempts to regain the Nestor Cup which they monopolised in the first half of this decade, O’Connor was not too quick to look past this Sunday and Sligo. The fact Sligo competed in division three over the spring (where they defeated both promoted sides, Tipperary and Louth ) makes no difference to the Mayo captain. “They’ll (Sligo ) will take huge encouragement from the division three teams who went on runs last year (Tipperary and Clare ) and even their own performance, for the most part, against Roscommon in the championship last year was excellent and having a championship match already, the chance to implement a system and see how it went and try new players will stand to them as well.